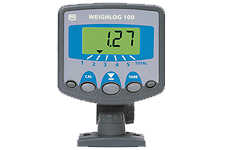 The Weighlog 100 is a user-friendly on-board weighing system that is suitable for a variety of applications including check-weighing incoming goods, trailer and hopper loading and batch blending. Multiple channels enable accurate load accumulation of various products for different applications and batch weighing. Check-weigh incoming goods, aiding stock management. Multi-channel load weight display with grand total summary. Static and dynamic weighing modes for full ‘weighing on the lift’ capability. 5 display channels for multiple attachments, stores, products etc. Water and weatehr proof construction – suitabel fro vehicles without cabs.